The construction of a rustic train station brought more than trains to Templeton. 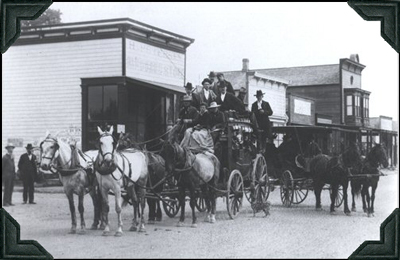 Shortly after the first passenger train arrived at the Templeton train station on Nov. 29, 1886, the town sprouted hotels, restaurants, saloons, and a newspaper. To celebrate the community’s 132nd year since its founding, on Nov. 17 from 12 p.m. to 3 p.m., the Templeton Historical Museum Society will host events at the museum and train station depot. Beginning at noon, and again at the top of each hour, there will be a 10 minute presentation of Templeton’s history followed by complementary pie and cake at the old train station depot. At 1:30 p.m., a docent will lead a walking tour of downtown Templeton where historic structures and places will be highlighted. Docents will also be available for tours of the museum, the train station and the old blacksmith’s shop where blacksmith Max Randolph will provide demonstrations. The newly renovated 1932 Templeton school bus, the 1926 Model “T,” and other vintage vehicles will be on display. Prints and paintings by local artists will be sold at a silent auction. More information can be found on the Templeton Historical Museum Society’s Facebook page or on the webpage, or email at info@templetonmuseum.com.